I love the way that Osteospermum just brighten up a container. Osteo’s tend to be a early bloomer that can tolerate some cold. They will continue to bloom all summer and look great when mixed in with other annuals. In the picture above I have Soprano® Light Purple Osteospermum planted in a combo with Diamond Frost. It is a very nice wispy looking planters and the white and light purple colors compliment each other very well. 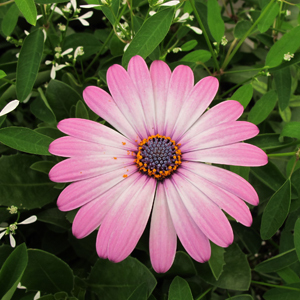 Soprano® Light Purple Osteospermum displays bright, blue-lavender daisy-like flowers that bloom from Spring until Fall. Soprano® Light Purple does well in hanging baskets, window boxes, landscaping and combination planters. Keep in mind that your beautiful combination containers are really small scale gardens. Healthy plants, good quality potting soil, and fertilizer are great garden starters but with a little tender care your containers will remain healthy and gorgeous all season long. Observe your containers regularly. Don’t forget to take down your hanging baskets to take a look inside. Some birds seem to think they are great nesting sites! Check the undersides of leaves and stem branches for bugs and insects. Remove any bugs you see and if necessary consult with your local garden retailer with any questions. Clean out any dead foliage to prevent rot and try to avoid excessive wet foliage and poor air movement to keep your plants healthy. Deadheading or cutting off spent flowers will improve the look of your plants and promote developing new flowers. Most plants tolerate and even benefit from pruning and trimming. As the season progresses more vigorous plants can be trimmed back to blend in better and any untidy growth may be removed. A fresh reshaping of your planter will improve the look of your design and a healthy trim will produce a thicker, more lush new growth. Taller varieties of plants may also benefit from staking to improve the form of your combination containers. With a little TLC you can enjoy a full season of fantastic container gardens! Cultural Care- Clematis Prune Groups- What do they mean? Depending on the cultivar, Clematis bloom from various types of growth each year. It is important to understand how each cultivar blooms in order to properly prune them. When done properly, pruning will promote flowering. Conversely, when Clematis are not pruned properly, the flowers will be delayed or they might not flower until the next growing season. For example, certain varieties flower only on the previous year’s growth. These cultivars should only be pruned to remove weak or dead stems after they have finished flowering. To help avoid confusion, Clematis can be separated into groups based on their flowering characteristics and pruning preferences. For your convenience, these groups are listed below. You can also view the specific pruning requirements for each cultivar by clicking on the ‘More Detail’ link at the end of each cultivar description in our online catalog. Our general recommendation is to prune all Clematis to about 12 inches within the first year of planting. This encourages them to form a strong root system and promotes new shoots to develop which leads to more flowers in the future. In the following years, they should be pruned to a height of 3 to 5 feet or by following the specific pruning guidelines for each specific cultivar as outlined below. Clematis cultivars in this group flower on the previous season’s growth. Generally, they can be left unpruned. If pruning is necessary, wait until the flowering is completed and remove only the weak or dead stems. These cultivars produce early season bloom on the previous season’s growth and late season flowers on new growth. Generally, these cultivars are only pruned to shape. In the early spring (February or March), prune them lightly above the first pair of new swollen leaf buds, removing about 12 inches from each shoot. Also remove any dead or weak stems at this time. Varieties within this group flower on the new season’s growth; they are often the most vigorous cultivars. Prune all of the main stems back to about 3 feet above the ground in February or March, leaving at least one pair of strong looking buds on each stem. Also remove any dead or weak stems at this time.